Aspens are also aided by the rhizomatic nature of their root systems. Most aspens grow in large clonal colonies, derived from a single seedling, and spread by means of root suckers; new stems in the colony may appear at up to 30–40 m (98–131 ft) from the parent tree. Each individual tree can live for 40–150 years above ground, but the root system of the colony is long-lived. In some cases, this is for thousands of years, sending up new trunks as the older trunks die off above ground. For this reason, it is considered to be an indicator of ancient woodlands. 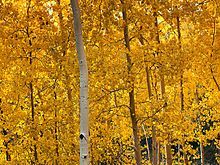 One such colony in Utah, given the nickname of "Pando", is estimated to be 80,000 years old, making it possibly the oldest living colony of aspens. Some aspen colonies become very large with time, spreading about 1 m (3.3 ft) per year, eventually covering many hectares. They are able to survive forest fires, because the roots are below the heat of the fire, and new sprouts appear after the fire burns out. The high stem turnover rate combined with the clonal growth leads to proliferation in aspen colonies. The high stem turnover regime supports a diverse herbaceous understory. Aspens do not thrive in the shade, and it is difficult for seedlings to grow in an already mature aspen stand. Fire indirectly benefits aspen trees, since it allows the saplings to flourish in open sunlight in the burned landscape, devoid of other competing tree species. Aspens have increased in popularity as a forestry cultivation species, mostly because of their fast growth rate and ability to regenerate from sprouts. This lowers the cost of reforestation after harvesting since no planting or sowing is required. Recently, aspen populations have been declining in some areas. This may be due to several different factors, such as climate change, which exacerbates drought and modifies precipitation patterns. Recruitment failure from herbivory or grazing prevents new trees from coming up after old trees die. Additionally, successional replacement by conifers due to fire suppression alters forest diversity and creates conditions where aspen may be at less of an advantage. Sudden aspen death is also occurring more often as a result of drought stress. Young aspen bark is an important seasonal forage for the European hare and other animals in early spring. Aspen is also a preferred food of the European beaver. Elk, deer, and moose not only eat the leaves but also strip the bark with their front teeth. Aspen wood is white and soft, but fairly strong, and has low flammability. It has a number of uses, notably for making matches and paper where its low flammability makes it safer to use than most other woods. Shredded aspen wood is used for packing and stuffing, sometimes called excelsior (wood wool). Aspen flakes are the most common species of wood used to make oriented strand boards. It is also a popular animal bedding, since it lacks the phenols associated with pine and juniper, which are thought to cause respiratory system ailments in some animals. Heat-treated aspen is a popular material for the interiors of saunas. While standing trees sometimes tend to rot from the heart outward, the dry timber weathers very well, becoming silvery-grey and resistant to rotting and warping, and has traditionally been used for rural construction in the northwestern regions of Russia (especially for roofing, in the form of thin slats). 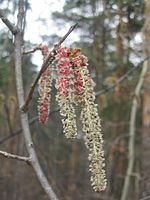 ^ "technology transfer fact sheet: Populus spp" (PDF). Forest Products Laboratory: R&D USDA. Madison, Wisconsin: United States Department of Agriculture Forest Service. Retrieved 20 September 2010. ^ "Populus sieboldii". Germplasm Resources Information Network (GRIN). Agricultural Research Service (ARS), United States Department of Agriculture (USDA). Retrieved 11 December 2017. ^ "Trembling Aspen". Alberta Wood Products. Forest Industry Development Branch, Government of Alberta. Retrieved 22 September 2017. Fox, Mark, Linda E. Tackaberry, Pascal Drouin, Yves Bergeron, Robert L. Bradley, Hughes B. Massicotte, and Han Chen (2013). "Microbial community structure of soils under four productivity classes of aspen forests in Northern British Columbia". Ecoscience 20(3):264–275. doi:10.2980/20-3-3611. Wikimedia Commons has media related to Aspen trees in heraldry. Wikisource has the text of the 1911 Encyclopædia Britannica article Aspen.